Kohner Vari-Vue TVs were made in the 1960s. These are are vintage Hanna Barbera toys although you can find more mundane topics. 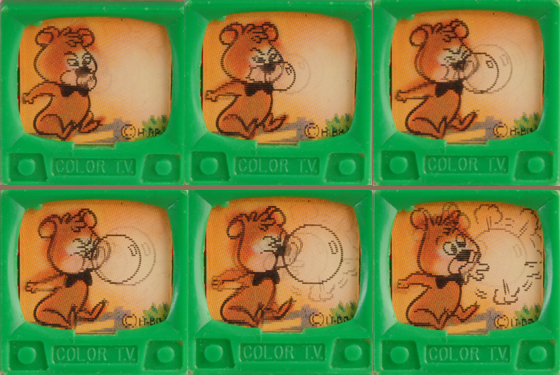 These are flicker toys, also often called lenticular toys. What that means is when you move the play TV up and down the figure moves. I currently have several. Huckleberry Hound plays a drum, Boo Boo blows a bubble, Yogi Bear gets squirted in the face, and Quick Draw McGraw takes pot shots at tin cans on a fence. You can see them all in action in the video below. 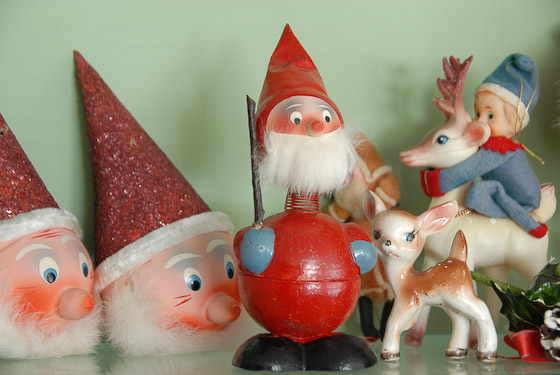 Vintage Easter Decorations of the 1950s and 60s make great holiday vignettes but can be hard to identify. Read on to learn more about these sweet bunny decor items. 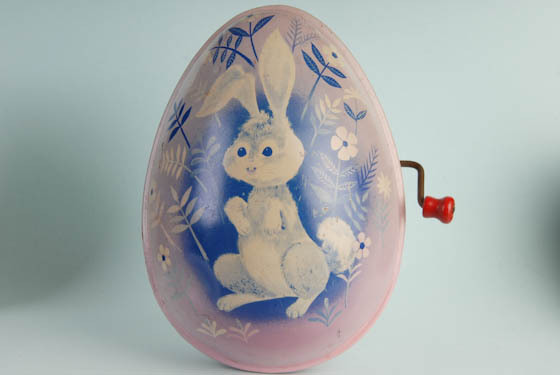 Vintage Easter decor is out there but definitely rarer than vintage Christmas or Halloween. Many items are also unbranded, which can exacerbate the hunt. The Knickerbocker above is a branded rabbit. He is marked on the back of his neck and is wearing the overalls so popular with bunnies of his era. 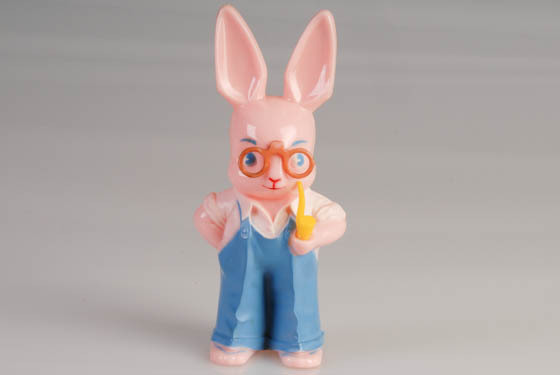 Knickerbocker rabbits with glasses came in both male and female versions and are particularly sought after (sorry this bunny has already been sold). The vast majority no longer have their glasses as they were a delicate component. 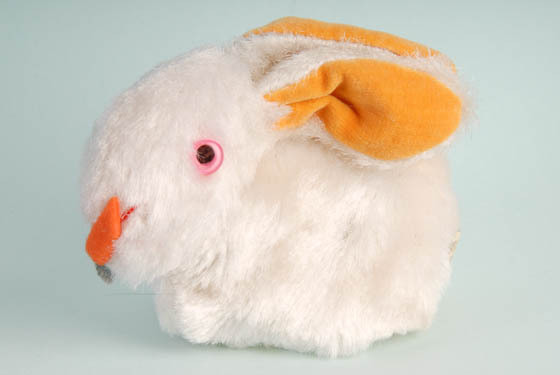 You can find Knickerbocker Easter bunnies that are rattles, like this one was, or that are made in the form of banks. Knickerbocker is best known for its Raggedy Ann and Andy dolls. They also made Holly Hobbie dolls. 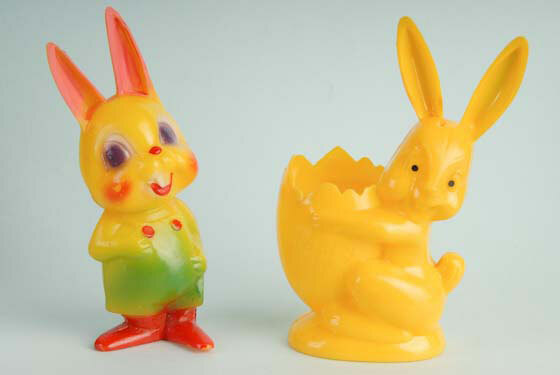 This brightly painted plastic rabbit above on the left was made by Corwin and is an example of an unmarked piece. You can find him in various paint trims. Corwin made a few different styles of hard plastic bunnies. 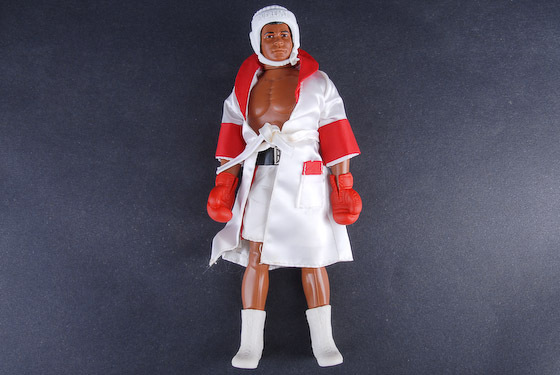 The company was also known for its plastic Nativity sets. Most of their items are unmarked. Surviving boxes and paper inserts show that the company was in Mt Vernon NY but I haven’t found out anymore. If you do have some knowledge about Corwin, please share. Also above, the yellow rabbit is a candy container that says Happy Easter. It was made by the highly collected company, Rosbro. Both of these rabbits are currently for sale in my Penn Polly Vintage Ebay store. Rosbro made quite a range of vintage Easter decorations. It seems their designers were particularly fond of animals with wheel barrows and wagons, but they also made a wonderfully strange figure of a bunny running a movie camera. You will also see roosters and chicks attributed to them. Rosbro and the School House Candy Company, both out of Rhode Island, were owned by the Rosen family. The candy company produced the sweets that were packaged in Rosbro’s fun plastic containers. 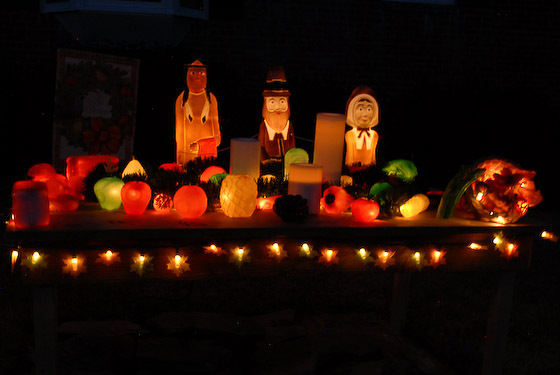 While Rosbro’s Easter creations are attractive, they are perhaps even better known for the creative Christmas and Halloween pieces that live on in so many households. Just do a search. You’ll be amazed at the diversity. 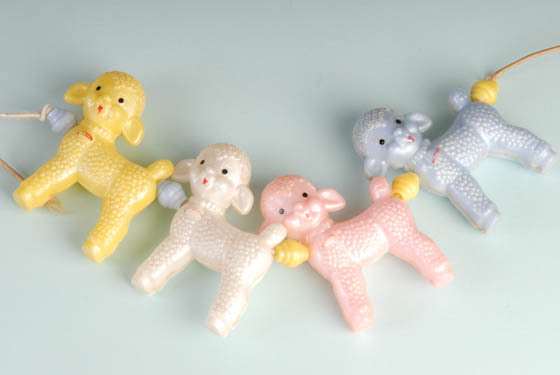 This string of lambs also falls into the hard plastic category (yes, I included a few non-bunny items). I found them as they were and do not know if they were part of a decoration or a pull toy. They are similar to, but have a different mold, than the Rosbro lambs. They are rattles with the belly of each lamb marked made in Hong Kong. They are most likely from the 60s given their style, markings, and material. B. Shackman produced unique novelties from the 1880s to the 1980s and had a store in NYC from which it did a roaring mail order trade. The little rabbit above has a Shackman label which indicates he was made in Japan. Pink eyes, velvet inner ears, and a carrot glued to his nose add to his vintage appeal. He was made as some sort of cover. The opening is too large for an egg and he doesn’t function well as a puppet. Perhaps he came as part of a gift set? He would look great as part of an Easter decor display – just stuff his belly with paper towels or a bag of jelly beans so he can stand up. Last on my list is a vintage Mattel musical tin Easter egg. You can find these with several different pictures – birds and two styles of rabbits. Most often the musical part of these eggs no longer work. This one does and it plays Here Comes Peter Cottontail. It is also available in my Ebay store. Have a listen in the video below I made for my Youtube channel. Happy Easter hunting! Penn Polly Vintage will be at URBNmarket’s Mosaic popup today and tomorrow! I’m bringing my modern living mix of sleek mid century with a little farmhouse and traditional. The Friday hours are 3 to 8pm and the Saturday hours are 11am to 5pm. If you head on down to 2920 District Ave in Merrifield VA you will find all the tents – and Penn Polly Vintage!